Manuel Palomar claimed the ability of the University of Alicante to identify new social needs, new educational niches and the latest indications from labour markets, as well as to account for the impact generated through the UA Social Responsibility Plan that will guide the remaining period of office. 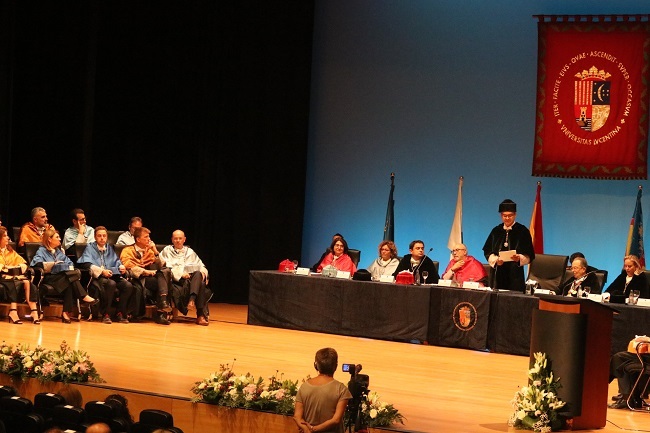 The University of Alicante Auditorium hosted the 2018-2019 academic year presentation with the traditional handing out of awards to the university members who have completed 25 years of service to the institution or who have reached the age of retirement. The ceremony was attended by the regional minister for Transparency, Social Responsibility, Participation and Cooperation Manuel Alcaraz..
During the ceremony, in order to meet and identify new social needs, new educational niches and the latest indications from labour markets, UA President Manuel Palomar claimed the ability of the University of Alicante to exercise its responsibility and underlined the introduction of the new undergraduate degrees in International Relations, Marketing, and Gastronomy and Culinary Arts, as well as the undergraduate degree in Medicine as part of the new proposal in his second term of office. 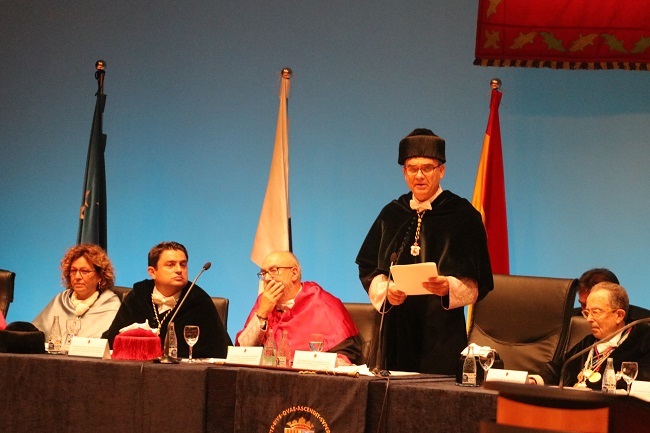 In this regard, the head of the academic institution stressed that the University of Alicante meets all the requirements (teachers, infrastructure, technology, laboratories and training programmes) to commit to teaching the undergraduate degree in Medicine. It will offer both traditional and new specialisation fields, aimed at training students in the scientific basis of modern medicine and the application of new diagnostic techniques and new therapies. Additionally, due to the high quality, innovative, creative and avant-garde curriculum, the undergraduate degree has been approved by the National Agency for the Evaluation of Quality and Accreditation, which is a guarantee to get the final approval by the regional government as it has never happened that a degree approved by the ANECA has ever been denied. 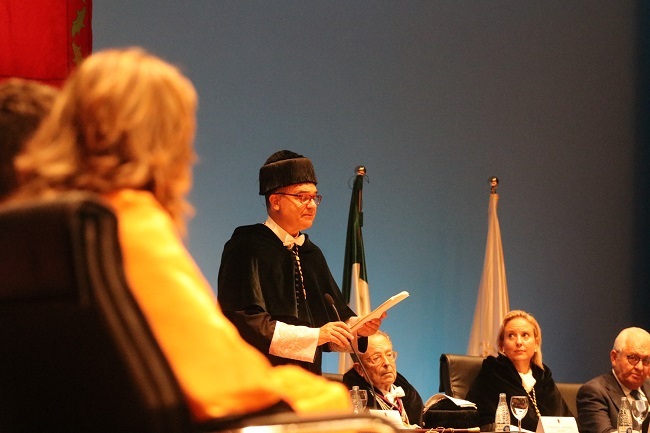 "And all the rest, if I may say so, is ... political, as it was the decision of desegregating the Faculty of Medicine from the University of Alicante in 1997," he pointed out, also remembering that "the demand for medical studies is still high and around 70 and 90 thousand doctors could retire in the next 10 years. A gap that will surely, sooner rather than later, be taken advantage of by private institutions, with higher costs and a clearly lower level of credibility and trust". Palomar also made reference to the opening of the new campus in Alcoy, where the undergraduate degree in Child Education has not only covered all places but there is a number of students in the waiting list, which has made them think about offering more places. The UA president reminded us that the University of Alicante is spread across 12 campuses, including the venue in Alicante city, and 17 off-campus culture halls all over the province as a way to contribute to the organisation of our territory. 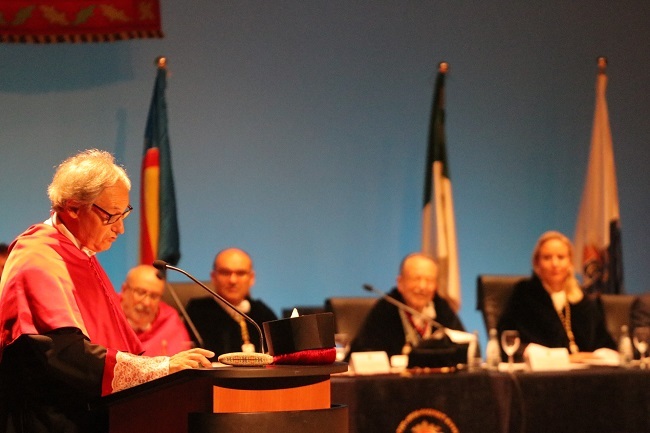 The newly approved University of Alicante Social Responsibility Plan was also a focal point in Palomar‘s speech, who ensured that it is an institutional commitment to establishing an ethical and transparent relationship between the institution and society. A strategic commitment that will guide our actions for the remaining period of office. In short, the UA president referred to the RSU as "a cultural turn of the institution, a crucial point and a holistic management strategy that implies a comprehensive policy that forces us to consider the many organisational impacts, which places among the small number of universities that have a strategy of this nature". University Registrar Esther Algarra was in charge of opening the ceremony with a review of the annual report of academic year 2017-2018. 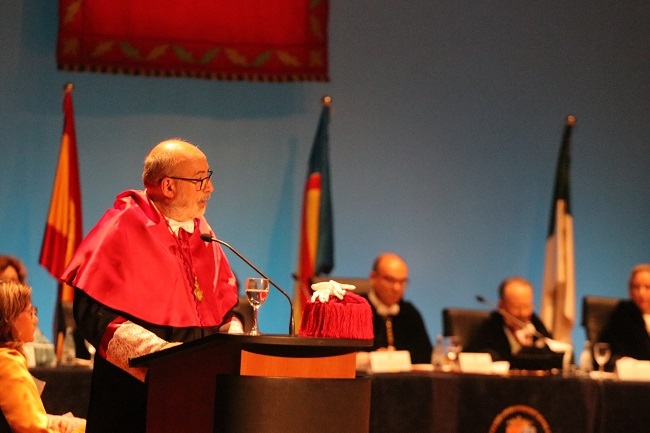 The inaugural lecture was given by University of Alicante Professor in Philosophy of Law Manuel Atienza, whose speech was based on a critical analysis of the Spanish university system intended to improve it. Regional Minister for Transparency, Social Responsibility, Participation and Cooperation Manuel Alcaraz praised the University of Alicante in his speech, referring to its academic and research excellence, successfully transferring knowledge to Valencian, Spanish and European society, and increasingly, entering the flows of globalisation. He also vindicated the policies of the Valencian government in the improvement of scholarships, which are allocated a total of 30 million euros, eight million more than in 2017. As for the undergraduate degree in Medicine, he added that it is now the regional government who is responsible for taking the next step. In this sense, they are now assessing all the points of the proposal. The decision will be taken through dialogue, taking into account all the variables and always prioritising the interests of the Alicante society and the general interest of the region. Before the beginning the ceremony, a group of University workers were convened by the UA unions and concentrated at the Auditorium entrance to protest, before the UA President and all the delegation, against the elimination of the administrative staff’s reduction of working hours, the teaching load of the over-60 academic staff, the career-wise 100% payment for the administrative staff and the replacement of the Research & Academic Staff Comprehensive Management Plan (CMP) by the new regional salary bonus, which has affected a large part of temporary lecturers.